Our friend, Mike, asked us to go with him to the Valley to buy the fall produce and do some relaxing sight-seeing. (Mike is always kept too busy here in Lunenburg ... http://365project.org/Weezilou/365/2010-05-15) Ken did the driving and we told Mike to chart the course. We had (my overused word...) "An Amazing" time! Mike steered us to some "Memory Lane" places from his childhood. I saw a sign for the town of "Old Barns" and said I had to have a picture! We stopped in Old Barns at a farm in with llamas & a donkey...he said to take pictures... As we drove away, he said that family had taken him in when he was a child. His father had gone back to school to study the ministry when his mother was stricken with tuberculosis. He joked that if we stopped to say hi, they would insist we come for dinner and stay over! (I believe it!) We drove away as the sun was at the height of the Golden Hour! I snapped this scene from the car window as we passed, but I asked Ken to stop & go back... It was a panorama not to be ignored nor overlooked. The homeowners here look down the gently sloping hillside to the Bay of Fundy (or some water tributary of same) and into the setting sun. Mike told me he came to understand that my gasping noises meant I needed to take another picture! I went on this trip for the photos...and I got them! As so often happens, I haven't seen but a fraction of what I took, but I came to this, and the moment there was so delicious, it's the first I wanted to share. Ken and I are plotting a photo tour of Nova Scotia next year...and I might need more than one... Some might think the pace too slow, but they've yet to be moved by the Spirit of this Heaven on Earth. This is stunning. Postcard perfect. Unbelievable! Fav! What a gorgeous capture. So beautiful. Amazingly beautiful photograph, and picture perfect!! The light is wonderful, and so is your vantage point.....looks like a place to long for!! Absolute FAV!! And, yes, I know those "gasping noises".....I believe I make them, too, and then I pout when we cannot stop a speeding car!! all this plus a view of the sea sounds perfect. @danette @anazad511 @panthora @chard Thank you all! Friday evening always seems slow (for me, at least) on 365, so lovely to see some friends here! 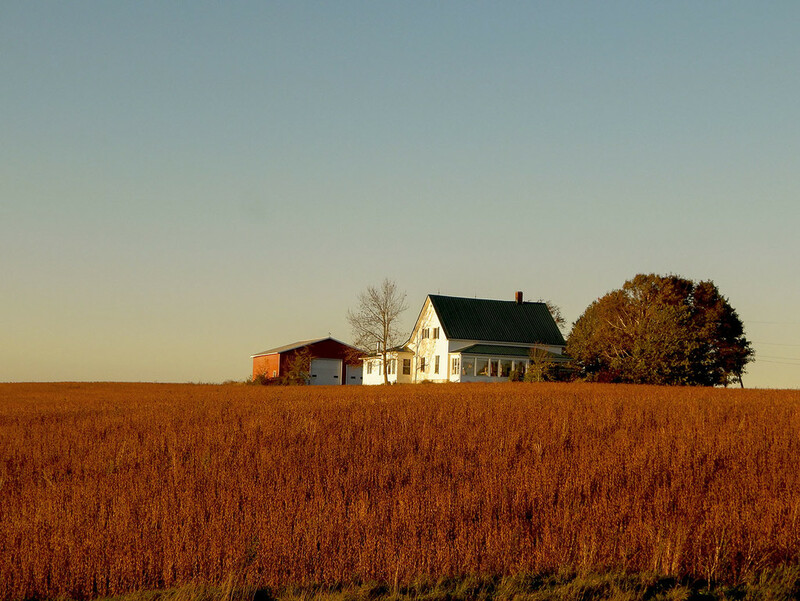 Amazing golden hour shot... look at the delicious reds of the foreground, your excellent low POV, the details of this house and the wide-open sky above. Lovely capture. Lovely picture. I was looking at it a good while. It looks a bit lonely place. My first thought was, "Lonesome." Beautiful. Lonesome. A beautiful shot, well composed. Caught the golden hour light well, lovely glow of colour on the field and light on the house. The feel of vastness and space of the province is there too. Fav. This is absolutely beautiful. The lighting you've captured is so strong and makes this postcard perfect. @dgrynn @pyrrhula @lynnilou @gilbertwood Thank you all so much! Truly, I opened it in RAW but didn't need to tweak the color... It was an amazing sight to see! Wow, this is really a stunning view, and that home nestled in the middle of quiet. It looks so peaceful, and I love the red tone to this field. Pure gold Louise, stunning shot. So glad you went back for photos. The rich colors of this image caught my eye in the thumbnail views. So enjoyed reading your commentary. Your enthusiasm for the beauty that surrounds you can be felt in your writing. Loved that part about the gasping noises and what they mean. Isn't that the truth! Absolutely fabulous! Such beautiful colours! Truly amazing shot - fav! i remember seeing something of this sort sixteen years ago when we drove around the maritimes. i fell in love with summerhill in prince edward island. we went drove around for a day in nova scotia and i promised myself i would come back one day. i still have to do that. maybe it's time to come back. this bucolic scene beckons me.